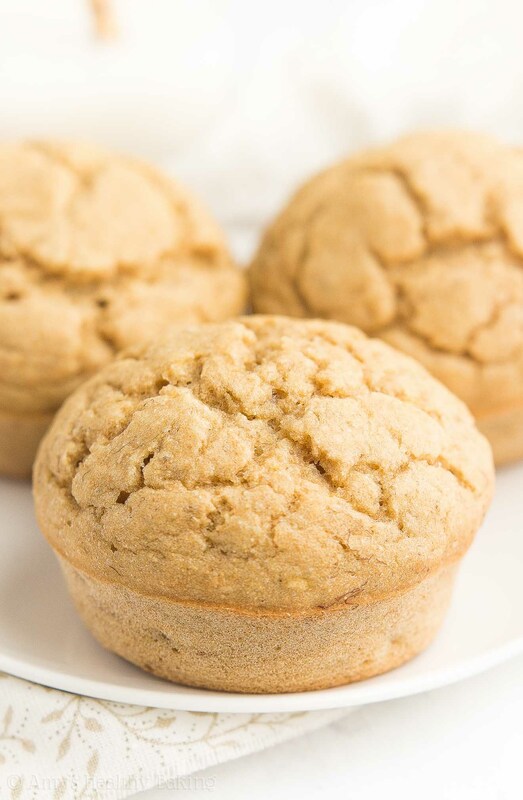 Tender, naturally sweetened banana muffins full of bright fruit flavor! So easy to make & only 101 calories! Plus virtually no tempting leftovers to worry about! One Saturday during my sophomore year of high school, my dad dropped me off at a friend’s house during the late morning. She lived three cities away, and because of the distance and our busy schedules—her with tennis and pole vaulting, me with band—we only hung out a few times during the school year. That particular day, we headed out for a walk almost as soon as I arrived. With an extensive park and trails area near her house, we were gone for nearly two hours, spending all that time exercising and laughing and catching up… And smiling at the multitude of dogs on leashes excitedly pulling their owners behind them! We started to feel a bit hungry by the time we returned, so we decided to bake muffins with some of the fresh fruit in her mom’s kitchen. My friend pulled out a recipe from her favorite cookbook, and we carefully measured and mixed together the ingredients before popping the pan in the oven. When the timer rang, we giddily pulled out our muffin tray, and we barely waited two minutes before helping ourselves. We plopped right down in the center of the kitchen floor, each with a piping hot muffin in our hands, trying not to burn our fingers or tongues as we took our first sweet, buttery bite. Within a few minutes, we each reached for a second… Then a third… And just like that, half the tray had disappeared. Those muffins were much too tempting and good! 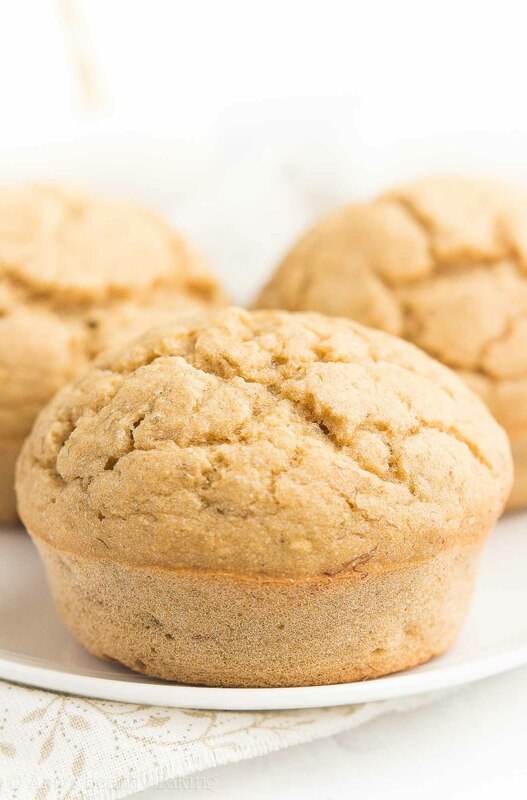 Since then, I’ve realized one of the best ways for me to reduce that temptation is to make just a half dozen muffins—like with this Healthy Small Batch Banana Muffins recipe! They’re really easy to make, full of naturally sweet fruit flavor, and just 101 calories! Plus with just six treats on the counter, it’s easier to slowly enjoy each muffin instead of rushing through every bite to grab the next one…. At least for a savorer like me! ? So let’s talk about how to make these healthy banana muffins! You’ll start with white whole wheat flour (like this!). It’s not a combination of white (aka all-purpose) flour and whole wheat flour! White whole wheat flour actually has the same health benefits as regular whole wheat flour. The only difference? Regular whole wheat flour comes from a heartier variety of red wheat, whereas white whole wheat flour is made by finely grinding a softer type of white wheat (hence the name!). 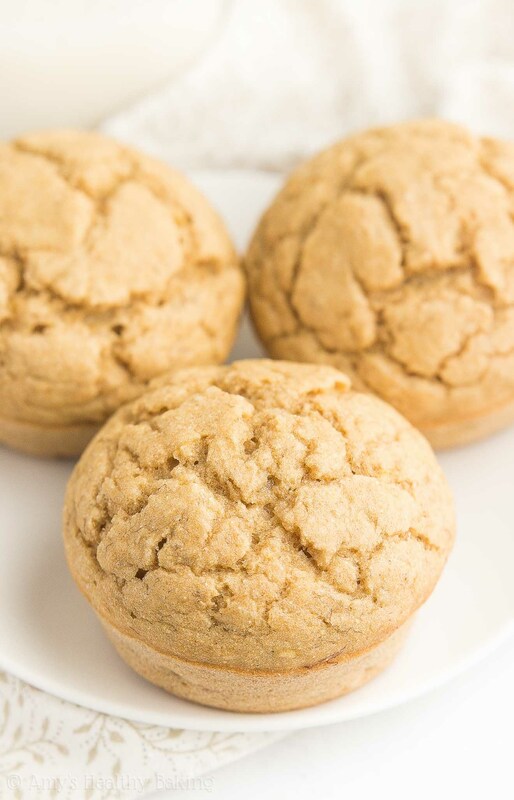 This gives white whole wheat flour a lighter taste and texture, which is perfect for these healthy muffins! Rather than traditional recipes that depend on lots of butter or oil to keep muffins moist, you’ll only use a mere ½ tablespoon in these! The rest of their tender texture comes from Greek yogurt and mashed banana. I love using Greek yogurt in my healthy baking recipes! It adds the same moisture as extra butter or oil for a fraction of the calories, and it gives your healthy muffins a protein boost, too. 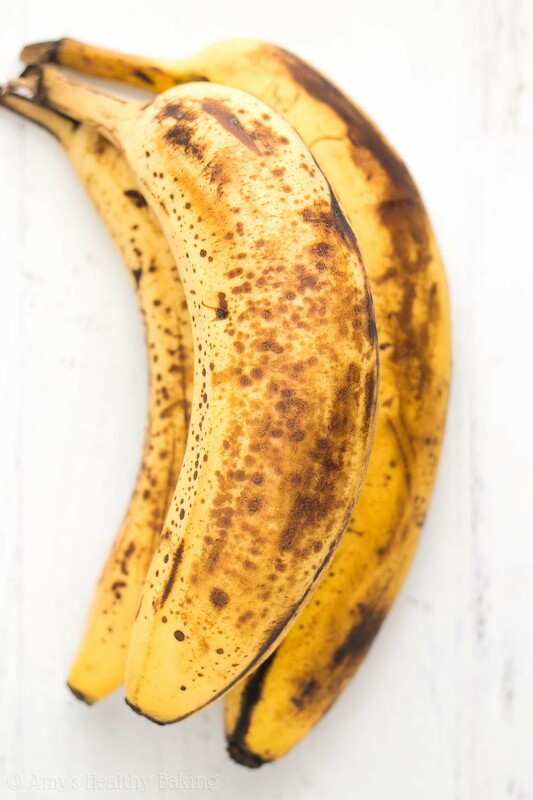 As for the latter, make sure your banana is really spotty and ripe! See those bananas above? That’s the minimum amount of brown spots I recommend… More is even better! That’s because brown bananas have a stronger flavor and more natural sweetness than the pure yellow ones. So you’ll only need to add a bit of pure maple syrup (like this!) 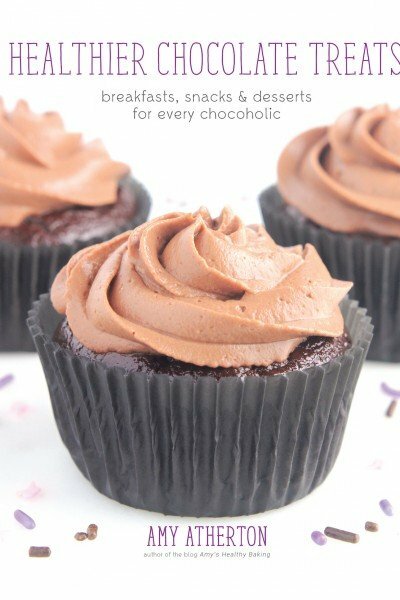 to boost the sweetness level of these healthy muffins! Enjoy your healthy banana muffins! ? And when you make your own, remember to snap a picture and share it on Instagram using #amyshealthybaking and tagging @amyshealthybaking IN the photo itself! (That guarantees I’ll see your picture! ?) I’d love to see your muffins! These are the best banana muffins I’ve ever made! They’re really tender and full of bright fruit flavor. Plus I love that there are virtually no tempting leftovers to worry about! The leftover muffins will keep for at least two days if stored in an airtight container on the counter or at least one week if stored in an airtight container in the refrigerator. Preheat the oven to 350°F, and coat 6 muffin cups with nonstick cooking spray. Divide the batter between the prepared muffin cups. Bake at 350°F for 20-22 minutes or until the tops feel firm to the touch and a toothpick inserted into the center comes out clean. Cool in the pan for 5 minutes before turning out onto a wire rack. Notes: For the gluten-free flour, I recommend the following: ½ cup (60g) millet flour, ¼ cup (30g) tapioca flour, ¼ cup (30g) brown rice flour, and ¾ teaspoon xanthan gum. Most store-bought blends (like this one!) will work, if measured like this. The mashed banana and Greek yogurt need to equal ½ cup. If you have slightly more mashed banana, decrease the Greek yogurt by the same amount, and vice versa. Honey or agave may be substituted for the pure maple syrup. For sweeter muffins, replace 1-2 tablespoons with an equal amount of pure maple syrup. 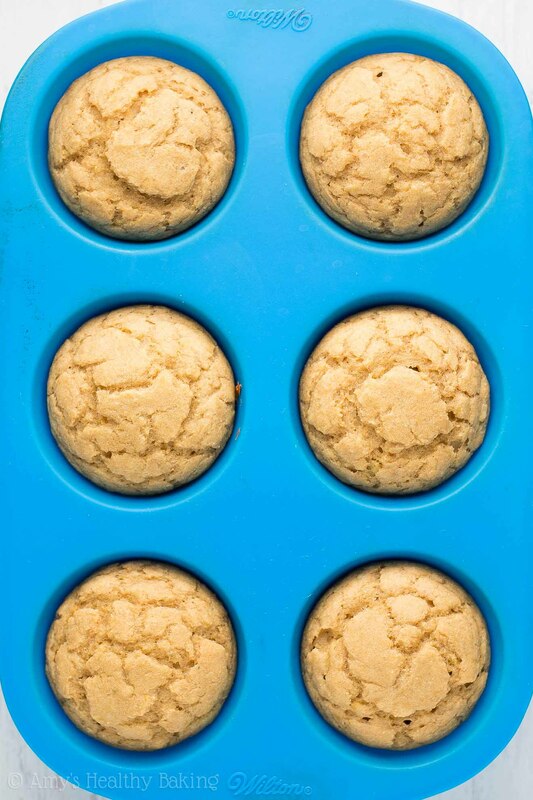 This is the 6-cup muffin pan that I use! I love how it doesn't over-brown the muffins' sides like traditional metal muffin pans. 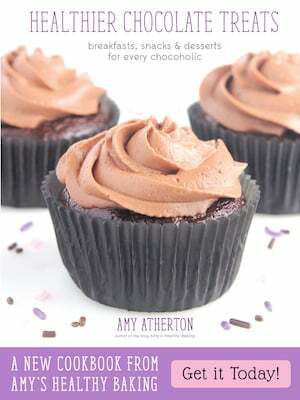 Hi Amy, these look delicious! Thanks for the tip to use a silicone pan. Do you have to put a cookie sheet under it or do you put it straight on the oven rack? My pleasure Manike! I don’t put a cookie sheet underneath my silicone muffin pan. I just put it directly on the oven rack! I’ve noticed that if I put a baking sheet underneath, the muffins’ bottoms turn darker brown, like when baked in a traditional metal muffin pan, and the 6-cup silicone muffin pan isn’t so floppy that it needs a cookie sheet underneath to stabilize it. 🙂 I’d love to hear what you think if you try these muffins! YES!! We should have a phone call walking date sometime! Or… Just convince the hubby to move down here?? 😉 Either way, miss you like crazy sweet pea!! 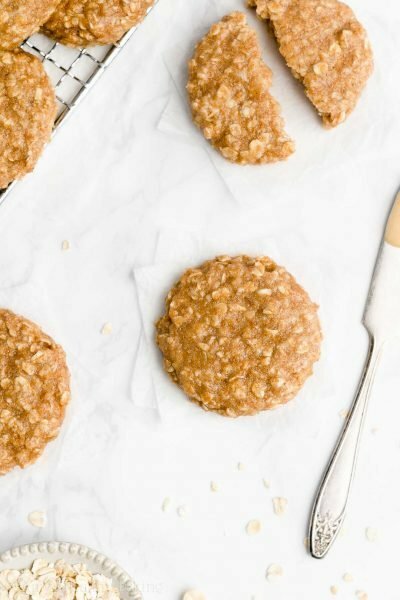 I replaced the flour with gluten free quick cooking oats, and added cinnamon and walnuts… the texture of the batter was a bit thick because of the oats, so I decided to form them into cookies instead! They came out pretty good and were a quick and easy recipe!! I am amazed that you don’t need eggs! First time looking at your page and I’m loving all of your recipes! 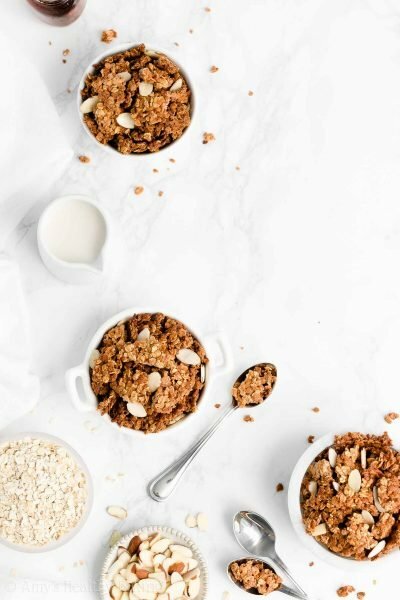 I am looking for something super healthy for my toddler who has a hard time with breakfast and I usually need something on the go for him. So far his favourite breakfast is pancakes made with overnight oats, banana and an egg. 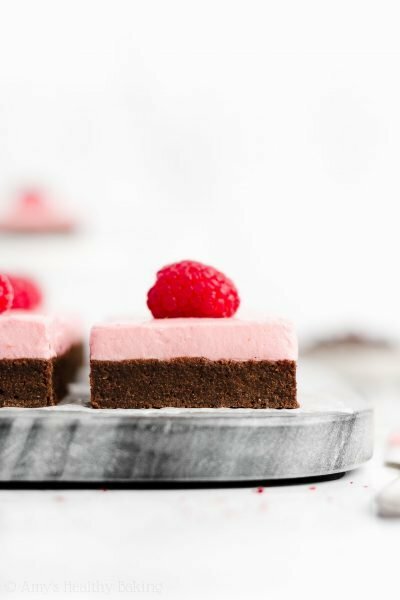 Can I add chocolate chips or blueberries to this recipe? Can I substitute the flour with the homemade oat flour that you explained how to make in another post? If so, same amount? 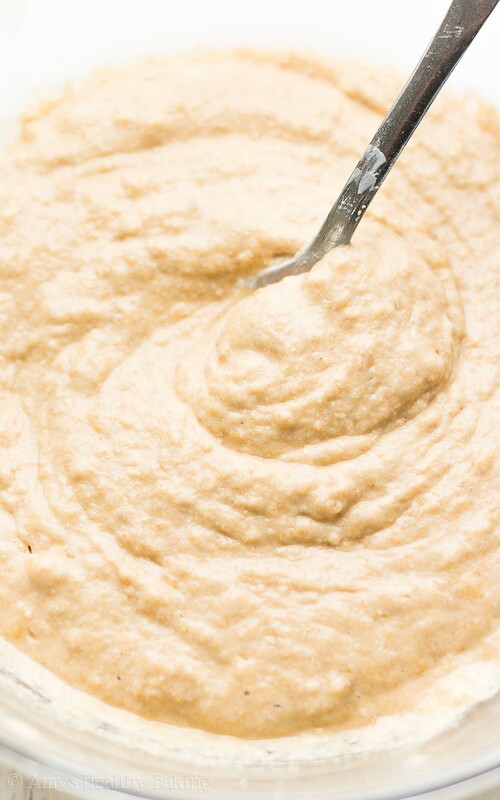 If not, do you have any other recipes to try the oat flour? I can’t wait to use it! I really appreciate your interest in my recipes, Cristina! I’m so honored that you’d want to make them for your toddler. 🙂 You can definitely add chocolate chips or blueberries to these muffins! 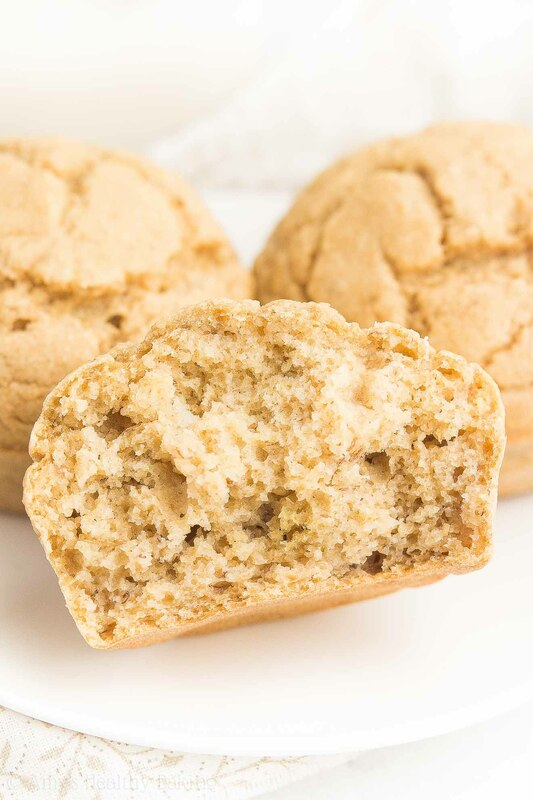 You can substitute oat flour, but the muffins will probably turn out slightly denser because oat flour lacks gluten — and gluten is what enables baked goods to rise and hold their shape while cooling. The best way to find specific recipes (like ones that use oat flour!) is to click on the “Recipes” tab at the top of my blog or use the Search Bar (located at the top of my blog, if you’re viewing on a computer, or the bottom of my blog, if you’re viewing on a mobile device). I can’t wait to hear what you think of these muffins if you try them! Thank you SO much! 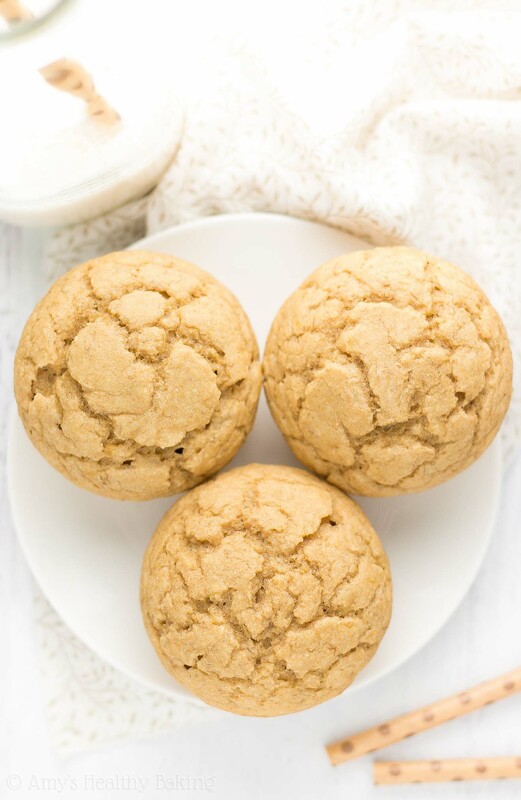 I tried these muffins with the oat flour and one of your oatmeal cookies recipe since I had 2 perfect bananas for baking … my 2 year old and 4 year old LOVED them! They kept asking more for and even my 4 year old said “it’s delicious” . 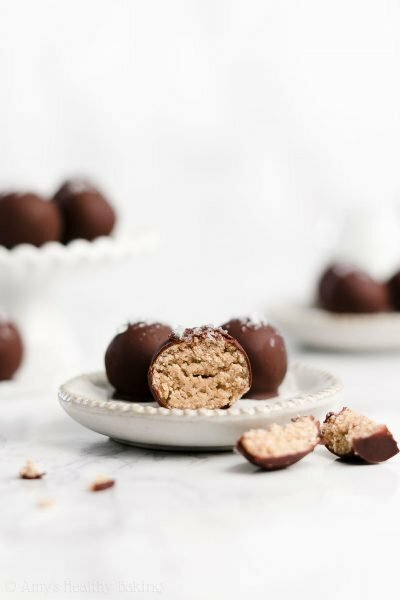 These recipes are so simple that I could make them with 2 VERY busy kids running and playing around. I doubled it but only used 1 tbsp of maple syrup since the bananas were so sweet. Next on my list is to make them those chocolate Teddy Grahams and the quinoa crackers to bring them for snacks to the park! Your recipes are changing our lives, I don’t know how I didn’t find you before. Just made these today and they’re amazing! Can’t belibe how low calorie and guilt free they are, thanks so much ☺️?